The Eva Naturals Vitamin C serum is a great all in one skin formula, it is all in one because this single serum has a concentration of multiple ingredients with many benefits. 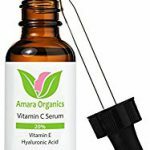 Vitamin C serums are very popular due to their great protection against UV rays and their ability to help repair sun damaged skin especially for those with colored patches on their skin known as hyperpigmentation. Hyaluronic Acid is usually added as well for hydration and as an anti-aging boost. You can find interesting studies on vitamin C, this study talks about the benefits of this vitamin on the skin, how it heals Sun damaged skin and how it is an effective treatment for hyperpigmentation. 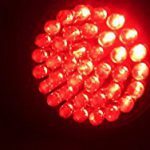 The study also discusses the issue that it is difficult to directly apply the vitamin to the skins’ surface and it being absorbed. That’s where Hyaluronic Acid comes in, due to this acid being thinner than water it is easily absorbed becoming the best form of delivery to the skin surface and its inner layers, for this reason you always see these two chemicals paired together into a serum. So when you have the two of them combined, you have product that heals the skin by making it smoother, removing color patches made by the Sun and reducing wrinkles. Salicylic acid 2% – If you recall from the Acne page or simply already knew, this chemical is one of the most effective ways to fight acne, it exfoliates the pores preventing clogging and it kills the bacteria on the surface of the skin. Retinol 2% – Also helps to unclog the pores thus preventing acne. Niacinamide 3.5% – Helps reduce inflammation and soothes the skin. Other natural ingredients like aloe to help hydrate the skin make this product a very difficult one to categorize. Eva Naturals has a long line of natural products and positive feedback making it a trusted brand. The amount of positive reviews on Amazon is also a pretty good indication on how well this product works. The 1 oz bottle is excellently packaged in a dark glass bottle to avoid direct light or heat affect the product. Always fully clean and dry your face before applying any product. This way your skin is nice and clean for the serum to be absorbed. You can use your finger to apply the serum just make sure to fully wash your hands before touching your face. The serum comes in a small bottle (1 oz. ), but a few drops go a long way. The best way to apply the serum is simply by dividing the application to your face into sections. Two drops can cover your left cheek, another two your right cheek, two more drops your forehead, one drop your nose and finally two more drops for the area around your mouth and chin. That’s only nine drops to get a good amount of product to cover your entire face. Some people with some products might get some breakouts the first or second week, do not let this discourage you, you are simply having a small reaction by the third and fourth week it will stop. If the breakouts continue then the product is not for you. With some of these natural products, the smell might not be pleasant, rest assure that once you apply the product the smell will go away. You can use the product at night and in the morning, if you do use it in the morning make sure you moisturize and protect your skin against the Sun, check out the recommended moisturizer with SPF 30 on the Red/Dry Skin page, great for acne prone skin since it won’t clog your pores. With all products whether for acne or scars, please remember that you have to try the product for at least a month before you notice results. When it comes to acne you will notice results after a month, for scars and wrinkles, it might take more than three months, remember that skin healing takes time and it is a process that needs to be tested with patience, don’t get discouraged early. If you need more tips, tricks and information on other products check out the Acne and Scars page. Check out the Eva Naturals Vitamin C serum over at Amazon, this is a great product with a lot of benefits, for those looking for something to help with their acne, their scars and their dry or wrinkled skin, you have an overall formula that will help you with all your skin issues. So let’s go over the check list of benefits: Anti-aging, check. Reduces Inflammation, check. Glows complexion, check. Exfoliates, check. Fades pigmentation, check. Boosts collagen, check. Reduce pores size, check. Hydrates skin, check. There is no need to continue the struggle to a perfect skin when the solution could be a few clicks away. So why wait? This product is giving great results to a lot of people, maybe is time to be one of them. If you have any questions or comments please don’t hesitate to write and I’m certain this product will help on your path to a Beautiful Clear Skin. This Eva Naturals Vitamin C serum seems to be a great product. Is there a minimum age to start using it? I first used anti-aging facial products in my early 30’s but I feel like nowadays people tend to use them even earlier. Do you think there would be any problems if a twenty-year-old used it? Not at all, the cool thing about this product is that it has other benefits and of course it helps heal Sun damaged skin which can happen at any time if you ever gotten a bad Sun burn, it’s never too early or too late to benefit from great skin products, thanks for reading. This product speaks for itself. I like the fact that it has natural ingredients to help the skin and not harsh chemicals which can create more problems for the skin. Would I buy this product. Yes! I am sold on the natural ingredients it contains. I think people with acne, who are looking for help will like this and give it a try. I would do also, thanks for the information. Glad you liked it, yes the product speaks for itself and will certainly help you, thanks for reading.